Aurora is co-sponsoring the third National Spring Maintenance Peer Exchange on September 20-22 in Bozeman, Montana. Like earlier events in Ohio (2007) and in Wisconsin (2009), this exchange will bring together state DOT snow and ice control experts and private-sector providers of services, equipment, and materials to share information, network about snow and ice control issues, and develop research problem statements. Other sponsors of this event include Clear Roads, the FHWA, the AASHTO Snow and Ice Pooled Fund Cooperative Program (SICOP), and the Pacific Northwest Snow Fighters. By participating in the discussions, these research organizations will better understand the gaps in knowledge, technology, and communication and work together to develop strategies to bridge those gaps. The peer exchange website documents the progress made on 53 research needs statements identified at the 2007 and 2009 exchanges. Reports from the 2007 and 2009 events are also posted on the website. Each report contains a summary of attendee evaluations. For more information, contact Lee Smithson, 515-239-1519, leland.smithson@dot.iowa.gov. Check out Aurora’s redesigned and updated website and let us know what you think. Contact Chris Albrecht, calbrecht@iastate.edu. Aurora’s primary informational brochure has been updated. Download and print a few copies of the online version so you can share it with peers at various venues. A joint Aurora-SICOP-Clear Roads brochure has also been updated, and an online version is available for printing and sharing. Aurora and Clear Roads have developed a valuable new online resource: the Knowledge Base for Road Weather and Spring Operations (www.aurora-program.org/knowledgebase). The website supplements and complements the face-to-face information sharing that occurs at Aurora and Clear Roads meetings and peer exchanges and is a permanent repository of shared information. The site has been designed so that anyone in the road weather and winter operations communities can share and retrieve useful information, including non-traditional and innovative techniques, methods, and materials used in winter maintenance and road weather sensing. It will be an ever-changing and expanding work in progress, as people add and update information. To jump-start the sharing process, Aurora and Clear Roads have populated the site with the results of formal research completed by the two pooled funds to date. But the true value of the website will be realized as members of the winter weather community contribute their wealth of knowledge and experience. Take a look at the site. To add material, you must first create an account. Follow the online instructions (http://knowledgebase.aurora-program.org/). Improvements to the site functionality will continue to be made in the coming months. If you have suggestions or comments, contact Chris Albrecht, calbrecht@iastate.edu. The objective of this project was to investigate the various options for getting RWIS and other data back and forth between remote sites and a central location, while looking for efficiencies of existing and new technologies that reduce costs, ultimately recommending specific technologies and/or methods to reduce telecommunications costs. The benefits of this research include cost savings and performance enhancements as states look to expand the data and services from upgraded RWIS sites. The objective of this project was to develop a road and weather condition reporting system that collects data electronically from remote statewide locations and delivers real time data electronically in a format to serve multiple uses. The final report details results of this research. To read the full report, click here. To ready the technology transfer summary, click here. This project evaluated a prototype of a new inexpensive sensor to be used in combination with RWIS. The objective of this project was to develop a web-enabled knowledge base that allows sharing and retrieval of road weather and winter operations information. When Aurora was launched in 1996, the Iowa DOT was a charter member. Later, Iowa became the lead state for Aurora’s FHWA pooled fund. Tina Greenfield, RWIS Coordinator in the Iowa DOT’s Office of Maintenance, represents Iowa in the Aurora organization and administers the pooled fund. According to Tina, the results of many Aurora projects have direct application to Iowa’s winter maintenance program. When she became the Iowa DOT’s representative to Aurora in 2004, for example, an Aurora-sponsored comparison of pavement temperature sensors was just being completed. The results of this study helped the Iowa DOT understand the various factors that affect pavement sensor accuracy and adjust its practices accordingly. The Iowa DOT leads or champions several Aurora projects, such as a recent updated cost-benefit study of RWIS and other road weather technologies. The original SHRP-led cost-benefit study was conducted in the late 1990s. The Aurora project reflects the significant advances in RWIS-related technologies in the last decade, plus the incorporation of internet capabilities and the enhanced access and use of data since the SHRP project was conducted. For non-member agencies wondering how Aurora might benefit them, Tina points to Aurora-developed software tools like an RWIS sensor network monitoring system. In addition, biennial peer exchanges are open to all agencies. 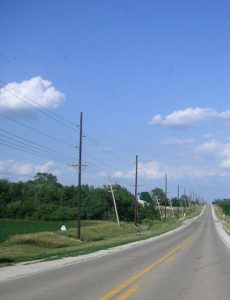 The Iowa DOT has led the two past and the upcoming (September 2011) peer exchanges. “These are among my favorite Aurora projects,” says Tina. In addition to Aurora members, one or two representatives from every Snowbelt state attend, along with a large cadre of vendors showcasing their RWIS-related software, technology, and equipment. Research results, new tools, and conferences are valuable, but according to Tina the most important benefit of participating in Aurora may be the regular exchanges that occur among members. “It is so useful to be around other professionals who are focused on the same topics,” she says. For more information, contact Chris Albrecht, 515-294-7684, calbrecht@iastate.edu.